With young girls turning professional before they even win their first national junior event, it's nice to see someone who has made full use of the all the tennis out there. Kristen Schlukebir has played the ITF and professional tournaments, but she has continued to make use of the knowledge and experience of playing the juniors. Now, at 18 years old, Kristen is looking toward her future in tennis. Kristen Schlukebir began competing in the Girls' 18s in 1999 when she was only 15. That year she was the doubles winner (with Raquel Kops-Jones) at the USTA National Indoors as well as the third place winner at the USTA National Claycourts. By 2000, sixteen year old Kristen was working her way to the top of the rankings with wins at the Franklin Winter Championships, Junior Spring Fling and T-Bar M Internationals. She also placed in the finals and semis of tournaments such as the Easter Bowl and Eddie Herr Internationals. 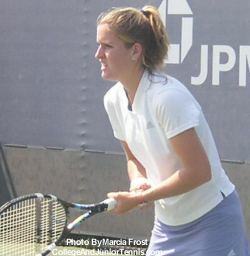 In 2001 Kristen began to play more International junior events, placing high in singles as well as doubles throughout her play. This year Kristen tried out professional tournaments (though retaining her amateur status) and even won a $25,000 USTA touranment. Between professional circuit events, Kristen and her frequent doubles partner Tanner Cochran won the Girls' 18s trophy at the USTA Super National Hard Court Championships. I sat down with Kristen Schlukebir at the US Open where she was playing Qualifying Women's Singles, Main Draw Women's Doubles and Junior Championships Singles and Doubles. Q: I understand you are going to Georgia Tech beginning this Fall? A: "No. Georgia Tech was actually a two week thing. I signed -- though my parents didn't sign -- and then said, 'Wait, I don't want to do this yet.' I'm taking a year off. Just to try it (the Pro Circuit) and see how I like it. If I'm doing well, I'll continue."